The first day of school. For children, it can be scary and exciting… opening them to new worlds. For elementary school teachers, it’s the start of a new year of inspiring students, and making a lasting impression on their future. Kindergarten and elementary school teachers teach foundation subjects— math, reading, science and social studies. They also teach appropriate interaction, setting and enforcing rules for behavior in the classroom, lunchroom, and recess. When students experience barriers to learning, teachers devise methods to help, and meet with parents to share student progress and challenges. 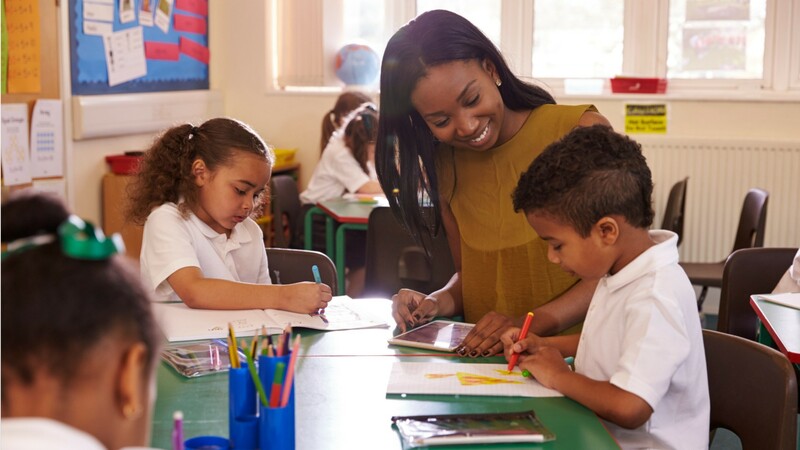 Elementary teachers work in both public and private schools. Class sizes— and the availability of textbooks… technology… and other materials— can vary greatly. Teachers are often accountable for student performance on standardized tests, which can be challenging. Teachers work full time and often put in extra hours to prepare lessons and grade school work. Many primary school teachers work a ten-month school year with a two-month summer break, although some also teach summer school. Teachers need a bachelor’s degree in elementary education; public school jobs require state certification. Some states require a college major in a subject such as math, language arts, or science. No mistake, it’s not an easy job— but teaching is more than an occupation, it’s a commitment. See more details at O*NET OnLine about elementary school teachers. Elementary School Teachers by U.S. Department of Labor, Employment and Training Administration is licensed under a Creative Commons Attribution 4.0 International License.